Book now the best shore excursions in Istanbul. High quality and safety at the lowest prices. If your are looking for the best Shore Excursion Istanbul, book now the best guided tours at lowest price with Ancora Tours. Since 2003 we offer you official guides in english, transportation and travel insurance, all included. The highest quality at the lowest rates. Our shore excursion in Istanbul is a fantastic mix of vibrant colours, fragrant spices and exotic architecture. Join us in this city of unique beauty, suspended between East and West, between Europe and Asia only by the Bosphorus strait. Please Note: we also provide a 7 hour shore excursion of Istanbul at €25; and two-days tour for stays longer than one day. Extra Fees: Basilica Cistern: €4. 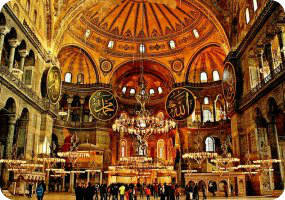 Open every day from 9 am untıl 6:30 pm, Hagia Sophia: €10. Closed on Mondays; Topkapi Palace: €10. Harem Ticket €5. Closed on Tuesdays. Souvenir: Turkish Delight sweets, be aware if you want a carpet because you might end up paying much more than its real value. Dress Code: Comfortable walking shoes are recommended and clothes respectful of sacred sites. Our shore excursion in Istanbul begins at the symbolic Hagia Sophia, one of the greatest surviving examples of Byzantine architecture. This landmark and symbol of the city was a Greek Orthodox Church for over 900 years and then an imperial mosque for nearly 500 years. Today it is preserved as a museum where we can admire the stunning dome and curved vaults decorated with mosaics. Next we head to Topkapi Palace, the ancient home of the Turkish sultans. This massive complex once housed up to 4,000 people and consisted of residences, mosques, kitchens, a library and a treasury – everything you might need to keep a sultan happy! The Istanbul shore excursion then continues in the chaotic Grand Bazaar. It’s one of the oldest markets in the world and packed with over 4,000 shops so prepare to immerse yourself in shopping heaven. Here you can pick up fragrant Turkish spices, many different type of tea and a whole number of handmade ornaments. Then, we’ll visit the popular tourist site and icon of Istanbul, the Blue Mosque. An impressive 21,000 blue ceramic tiles adorn the interior walls and dome. Outside, six towers (or minarets) and eight secondary domes help to paint a beautiful picture for us to admire. Five-hour tours will finish at the Blue Mosque, and then head back to port for boarding. Shore excursions over five hours will continue to the Basilica Cistern, a tourist attraction unlike any other. Its purpose was to store the city’s water supply, which this underground structure does in a beautiful way. The cistern was constructed using over 300 columns that together create an unusual, if a little spooky, atmosphere. Many columns were taken from ruined temples so look out for Ionic and Corinthian detailing. *The Grand Bazaar is closed on Sundays, mind Hagia Sophia is closed on Mondays. If any of the sights are closed during your excursion, our guides will instead visit other, equally interesting attractions such as the Süleymaniye Mosque for example.